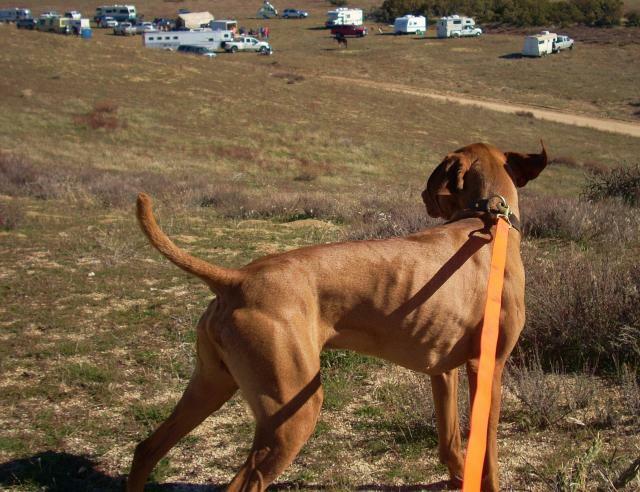 Hungarian Vizsla Forums > General Vizslas > Diet & Eating > Are visible ribs normal? Re: Are visible ribs normal? When you stand over your dog, you should be able to see a distinct waistline. When you look at your dog from the side, you should NOT be able to see his/her ribs. If your dog is making a turn while running and you can see ribs, that's okay... but not while just standing still. You should be able to feel the ribs, but not see them. Your puppy is growing and that, in itself, requires extrra calories. Regardless of what your breeder told you, I think Otto could use some more food. Here's a good way to do the increase. Always measure with a measuring cup. Add a little more to each meal than what you're giving him now. Inspect him every single day using the above guidelines. Adjust the amount up or down, until you can NOT see the ribs, but you can feel them. Every dog is different, because of their various exercise routines and overall metabolism. Close observation is really the best way. Also, make sure he always has a fresh bowl of water available to drink. Always. Otto will thank you! It's pretty normal for their ribs to show, especially as puppies. Didn't redbirddog recently say that his muscle machine male shows some ribs? That dog is far from undernourished! There are many superior brands of food out there for your pup though. I have a true hate for the Hills brand, as all the vets up here carry it and sell it at a premium price, as a premium food. Have a look at this site, and see the difference between the ingredients different brands use. Vizslas are athletes and need to be fed as such. I vote for a 6 star food, but you'll have to see what's available to you. Pups can get worms but I am going to guess you have ruled that out. Just make sure the food is good food with little or no corn filler. Here is a link on what makes a priemum dog food and why. When we train Bailey for field trials he looks like I am starving him. But he weighs in at 62 pounds of almost pure muscle. A thin Vizsla is like a long distance runner. Much better than a fat Vizsla! I really wasn't suggesting that you should "fatten up" your dog. That first link posted by Rod ("How Do I Determine if My Dog is Overweight") is very good and very specific. Read the third paragraph carefully and you will see this sentence" "If you can see the ribs, the pet is too thin." I'm just sayin' ... Otto could use a little more food -- high-quality, of course. He's a growing boy. p.s. Keep in mind that while Otto is still growing, that means all of his parts are still developing... heart, lungs, liver, kidneys, brain... everything. If pups don't get adequate nutrition, it can lead to developmental problems down the road. A fully grown adult dog that's a little "ribby" is probably not as dangerous to the overall health of the dog, but that is still considered too thin. I was talking about my dad. Every time I'm over at his place I tell him "Dad, you're feeding him too much" his response : "but he's so happy!" How can I argue with that logic??? However, we all know that overweight in pets and people is dangerous and can take years off what would have been a normal lifespan. Right now everything seems fine, but when the dog is 12 or 13 years old, and has become more precious with each passing year, the importance of a truly healthy weight becomes crystal clear... when you'd give anything for just one more month, one more week, one more day. So I'm not suggesting that anyone should overfeed their dog. Just repeating what I've learned. There is such a thing as too thin, as well as too fat. 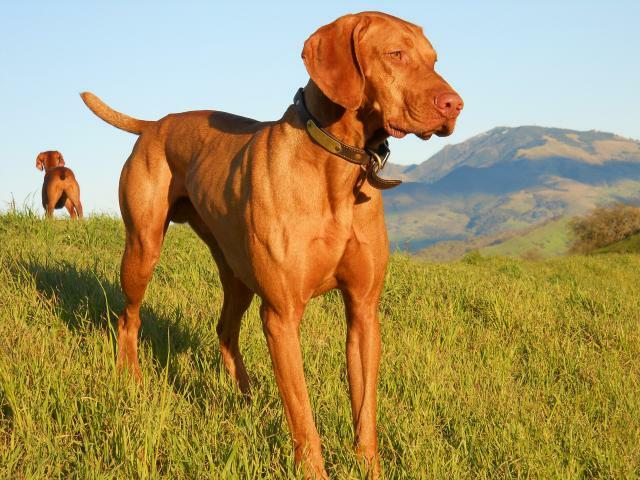 I do a lot of walking and see many of the Continental sporting dogs (Vizsla is one) that are overweight. On the flip-side, when you get into field trial competition, almost all the dogs are thin. They train hard to build up the endurance for a one, two or three hour hunt test. A field trial dog would be too thin for most folks. I plan to show Bailey for the first time in a few weeks in Reno, Nevada. To get him ready for the show, I have to put more meat on his bones. Show judges only want to see the slightest outline of the first rib on a Vizsla, no hip bone showing and no spinebones, or so I have been told. Got to mix up a batch of Satin Balls.